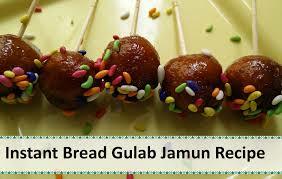 Gulab Jamun is a very popular dessert dish in India and surrounding countries. It is usually made with Khoya and panner (Cheese), both milk based items. But tried making it with Bread to ease out the process and the outcome was great. And the presentation in form of lollipops/candies, made it even more fascinating. 1. Remove the sides of the bread and roughly break the pcs. Add milk and make a soft dough. The dough should not be sticky so do not over knead the dough. 2. Divide the dough into small parts and prepare a ball by poutti ng little sugar inside it. 3. Simultaneously keep water, sugar and cardamom in a pan to make the chashni. Boil it over medium flame till it thickens up (cook till one-thread consistency). 4. Deep fry the balls in oil on low- medium flame till the gulab jamun turns golden brown. 5. Remove from flame and soak into the prepared chashni of water and sugar for atleast 1-2 hours. 6. Serve by using toothpick in each gulab jamun and coat with little sweet sauf.